⚓ T121736 Add secondary link icon for "view changes"
Add secondary link icon for "view changes"
Catrope raised the priority of this task from to Needs Triage. 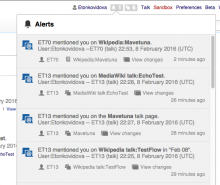 Catrope added projects: Notifications, Collaboration-Team-Archive-2015-2016. Assigning to Pau so he can upload the icon assets when they're ready. I added the icon to the ticket description. I followed the 24x24px black-color format used by other icons currently used as actions. Pginer-WMF removed Pginer-WMF as the assignee of this task. I can finish this tomorrow. If you have time and want to do it before then, that's fine with me. In order to get the icon to not look too big in context, I had to modify the SVG so that it has a 4px margin above and below the icon, like the other secondary link icons. Most OOUI icons are 16x16 icons centered in a 24x24 viewbox. Because the height was the main problem, I scaled your image from 24x18.46 to 20.8x16 (I also tried scaling to 16x12.3 but that looks too small). Catrope moved this task from RFP (notifications) to Needs Review on the Collaboration-Team-Archive-2015-2016 board. 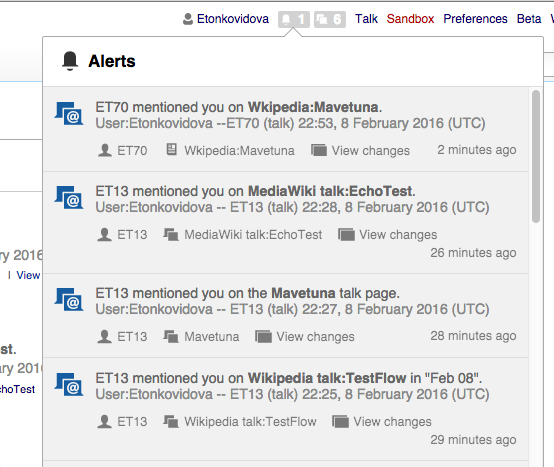 The edit-user-talk, mention and ep-course-talk notifications have a "view changes" secondary action. 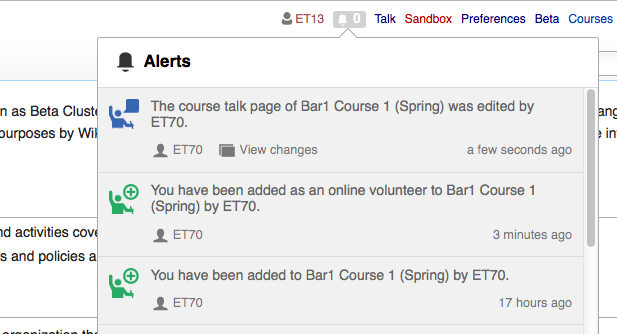 The ticket descripton mentions that View Changes should be in "The edit-user-talk, mention and ep-course-talk notifications." According to the V 2.0 Notifications Spreadsheet, the following Flow notifications also get View Changes as a secondary link icon. Do we need to see this icon on those notifications, or is it enough to know it's working (and we'll confirm those are using the right icon elsewhere? )?